Get the full Critter Nation accessory kit (all shelf and ramp covers shown) for just $40.70 with free shipping! 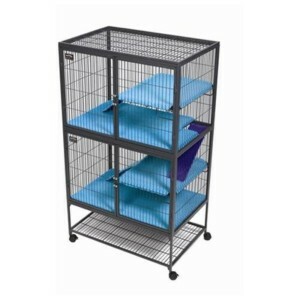 Critter Nation cage accessories are a welcome addition to any Critter Nation cage and ensure that it is as safe and comfortable as possible for your precious pets. 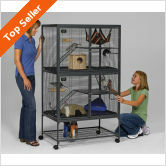 Critter Nation cages are amazing as shipped but many owners end up customizing them slightly to fit their needs. The removable shelves and pans in CN cages are very sturdy and designed to last for years, with quick removal making for easy cleaning. They’re made of hard plastic, however, and not designed for comfort. That’s why more and more owners turn to the Critter Nation Cage accessories pack. Each accessories pack comes with soft, machine-washable covers made of fleece for all trays, shelves, and ramps that are designed to fit perfectly. Some owners in the past make their own covers but this can be difficult and sizing isn’t always exact, with material hanging over the edges that pets could become entangled and trapped in. Amazon is your best bet as far as where to buy the Critter Nation accessories pack featured here, as they consistently have the best prices. Prices do fluctuate slightly over time but the current best price at Amazon is $40.70 with free shipping. Many owners buy two or more sets of shelf and ramp covers, as this lets them swap them out and wash one set while cleaning cages. As anyone with rats, ferrets, and chinchillas knows, covers of any sort are likely to be chewed on (or chewed up) over time so having an extra set of covers on hand is always a good idea.